As the Raise Hope for Congo campaign manager, I have traveled from Los Angeles, to Athens, OH, to New York City, and to Durham, NC to engage with students as they fight for human rights on their campuses. Last month I returned to my hometown and to my alma mater, the University of Wisconsin-Madison. I joined Katy Johnson, a UW-Madison student who interned at the Enough Project over the summer, to host the launch of UW-Madison’s Conflict-Free Campus Initiative. Katy returned to Madison a senior, the president of the UW Chapter of Amnesty International, and eager to launch the Conflict-Free Campus Initiative. Working with Katy to plan the UW-Madison event was extra special. It was during my years at UW-Madison that I first traveled to Africa. My housemate, Kou, a Lost Boy from South Sudan, invited me along on his homecoming after becoming a U.S. citizen during our sophomore year. That first trip to Africa was eye opening in many ways. It collapsed the distance I felt between Africa and myself, a perceived distance that left me feeling powerless to effect change. As I began learning about some of the challenges that African countries face, in particular the Sudans and Congo, I felt inadequate and unqualified to get engaged. Returning from that first trip, I began to see Kou’s family as my family, my brothers and sisters. I began to feel a sense of connection that led to feeling empowered. I began to believe that I had a role to play and could make a difference in the way that the United States government, activists, and youth engaged in Africa. Over a decade later, on this trip to my alma mater, I knew we had to make this event huge. Katy blew away my highest expectations. 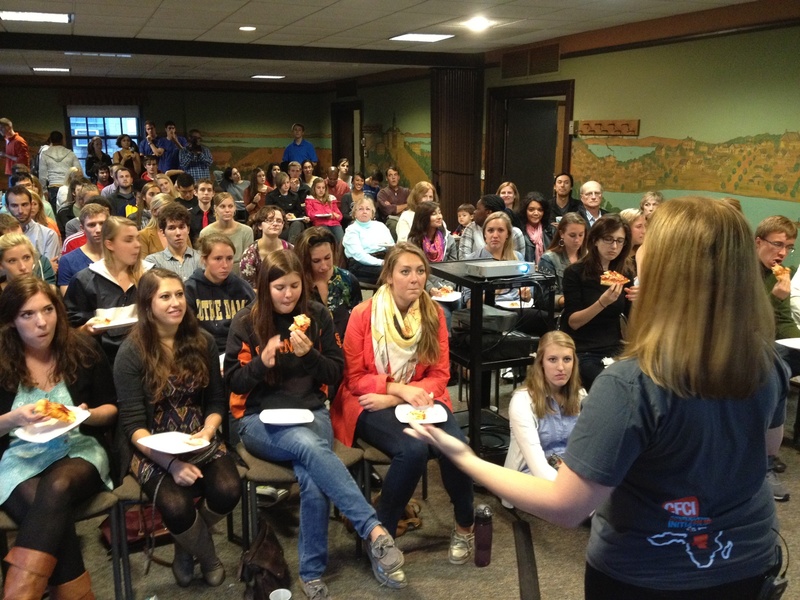 She filled the large, historic Memorial Union room with a standing-room only crowd. Katy had reached out to Madison’s finest student orgs: EDGE (Empowerment through Development and Gender Equality), Students Against Trafficking, Promoting Awareness, Victim Empowerment (PAVE), and the African Student Association. Both of Madison’s student newspapers were present, earning the launch the front page of the Daily Cardinal and the Badger Herald. A host for a student radio program was also on hand and covered the event. Most meaningful was that all four of Friday night’s speakers were Madison natives: Katy, a senior at the UW; Anna Taquet, who moved to Madison from France at the age of 10 and recently observed the Congolese elections with the Carter Center; Tosha Songolo, who was born in Congo and spoke passionately about a recent family trip to eastern Congo; and myself. That all four speakers had Madison ties strengthened the theme that our community is connected to Congo and must share in the solutions. As Katy explained, we are all linked to the trade of conflict minerals through our electronics purchases, so through our leverage with the companies that manufacture them, we have the power to advocate for responsible sourcing of minerals. We ended the night with Congolese dance lessons, led by Tosha, with full Wisconsin participation. It was quite a sight. We were reminded that what unites us is far greater than any perceived distance. We took bold action at UW-Madison, uniting a powerful coalition that is poised to become the first Big Ten campus to pass a conflict-free resolution. I believe that everyone present felt closer to Congo than when they arrived.